Once upon a time, there lived a kind old man and a mean old man. The kind old man had a big lump on his right cheek, and the mean old man had one on his left cheek. One day, the kind old man went to the mountains to get firewood. He was tired from working and fell asleep in the shade of a big tree. The old man woke up to lively, loud voices, and from behind a tree he saw small and big demons, red and blue demons sitting in a circle, drinking rice wine. At first the old man was astonished and scared by the sight, but he slowly became happy as he watched the demons sing and dance. “Hmm, this looks like fun. said the demons surprised at the stranger’s appearance. But soon, they started clapping for the old man’s funny dance. said the third demon, and took the lump from the old man’s cheek. The kind old man went back joyfully having been taken his lump. This kind old man’s story made the mean old man very anxious to meet the demons; so he went to the mountain on the day of their next party. 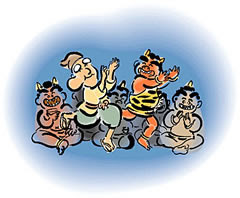 When the demons started drinking, the mean old man went right up to them, and began dancing. The demons first were happy, because they thought it was there friends from last night again. Immediately they sent their best dancer to dance with the old man. However, his dance was so bad that the skillful demon got really angry at him. said another demon, thinking this was the kind old man. Still mistaking the two old men, another demon said, and he put the kind old man’s lump on the mean old man’s right cheek. Now with a lump on both cheeks, the mean old man walked home crying full of regret for being so selfish. hmmm sorry just felt I had to point out the story is called in english "little red riding hood"
I changed the name to Little Red Riding Hood, I like this name more ^-^.